The Late Show, introducing a NEW protagonist, Renee Ballard. She is a tough young detective who has filed a sexual harassment complaint against her supervisor and has therefore been punished by being assigned the night shift. Renee starts investigations but has to turn her cases over to the day shift. This doesn't fly with her and...well, you'll find out. 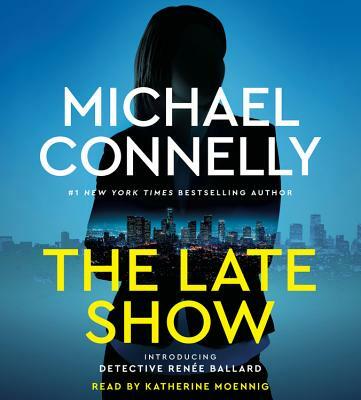 #1 New York Times bestselling author Michael Connelly introduces Renee Ballard, a fierce young detective fighting to prove herself on the LAPD's toughest beat--the Late Show. Renee Ballard works the midnight shift in Hollywood, beginning many investigations but finishing few, as each morning she turns everything over to the daytime units. It's a frustrating job for a once up-and-coming detective, but it's no accident. She's been given this beat as punishment after filing a sexual harassment complaint against a supervisor. But one night Ballard catches two assignments she doesn't want to part with. First, a prostitute is brutally beaten and left for dead in a parking lot. All signs point to a crime of premeditation, not passion, by someone with big evil on his mind. Then she sees a young waitress breathe her last after being caught up in a nightclub shooting. Though dubbed a peripheral victim, the waitress buys Ballard a way in, and this time she is determined not to give up at dawn. Against orders and her partner's wishes, she works both cases by day while maintaining her shift by night. As the investigations intertwine, Ballard is forced to face her own demons and confront a danger she could never have imagined. To find justice for these victims who can't speak for themselves, she must put not only her career but her life on the line. Propulsive as a jolt of adrenaline and featuring a bold and defiant new heroien, The Late Show is yet more proof that Michael Connelly is "a master of the genre" (Washington Post). Michael Connelly is the author of twenty-nine previous novels, including the #1 New York Times bestsellers The Wrong Side of Goodbye and The Crossing. His books, which include the Harry Bosch and Lincoln Lawyer series, have sold more than sixty million copies worldwide. Connelly is a former newspaper reporter who has won numerous awards for his journalism and his novels and is the executive producer of Bosch, starring Titus Welliver. He spends his time in California and Florida. Late Show introduces a terrific female character: Detective Renée Ballard. . .